Design bloggers Monica and Jess turn a family's old dining room into the perfect playroom for their kids. They used a few tricks of the trade to get a high-end look in the room on a budget of just $1,000. Monica and Jess are always looking for a challenge. So when they received a call for help from a family looking to turn their old dining room into a kid's playroom, they couldn't pass up the opportunity. But when they discover that they only have $1,000 to complete the entire project, they know they will have to get creative. Homeowners Shannon and Anthony have high-end taste and have sent over some inspiration photos representing what they want in the room. It would cost thousands of dollars to create the designer room that the homeowners desire. So, Monica and Jess have their work cut out for them. They plan to DIY their way to a custom look in the room for less! Anthony doesn't believe it can be done! Monica and Jess are determined to prove him wrong! Monica starts by making a custom kid-size table for the room. By making it herself, she is able to save hundreds of dollars. She gives the table a high-end look by painting the legs white and staining the top brown. Click here to see how to make a kid table. Jess gets creative by making a clock out of an old bicycle wheel, a yard stick and a paint can lid. This budget-busting project only cost $15! Click here to learn how to make your own bicycle wheel clock. Jess picked a neutral grey color for the walls in the room. She plans to use a lot of colorful accessories for an extra touch of color. Then, Monica and Jess show the homeowners some tricks of the trade for building bookcases that look high-end. Getting a professional carpenter to build a custom bookcase could cost you thousands of dollars. But these design bloggers have an idea that won't break their tight budget. Click here to find out how to build custom built-in bookcases. As the room makeover continues, Monica creates personalized kid-friendly seating and then the designers make two desks out of a few inexpensive materials. The customized desks have a high-end look with virtually no carpentry involved. It's a project anyone can do! After two days of hard work and some creative spending, designers Monica and Jess have finished transforming Shannon and Anthony's old dining room into the perfect playroom for their kids. The homeowners were shocked that they were able to create a stylish and functional space for their children for only $1,000. Design experts Monica and Jess meet with homeowners Shannon and Anthony to discuss their vision for their children's playroom. They want to create a high-end look in the room for under $1,000. Kid-size furniture is often really pricey and hard to find. But you can easily build your own. Get DIY tips for building a custom table for your kids for under $100! You can turn your old bicycle wheel into a fun and unique clock with these easy DIY tips! High-end, built-in bookcases can cost a fortune, but by using existing pieces of furniture as your framework, you can create the same look at a fraction of the cost! Get a few DIY tips! Create custom seating for your kids playroom or bedroom with these DIY tips. This project utilizes store-bought cube seats that are easy to work with and simple to customize! Get step-by-step directions and see detailed photos of the DIY projects from the playroom. 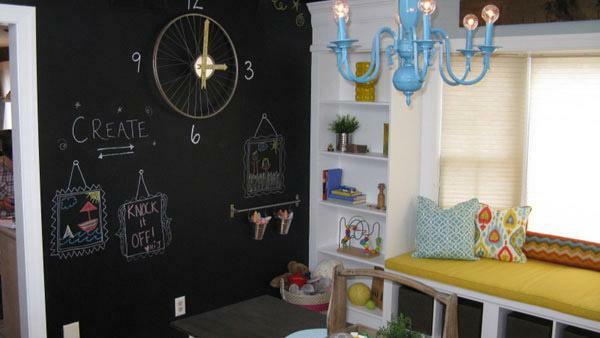 Jess and Monica makeover a playroom on a $1,000 budget.